A month ago we got the 3D re-release of Jurassic Park, and a few weeks later we got Far Cry 3: Blood Dragon featuring dinosaurs of all kinds shining under neon lights. This happy coincidence provides us with an opportunity to gather some of the most amazing video games that have dinosaurs stomping around inside them. Raptors, T-Rex and Pterodactyls already have their cool statuses safely secured, but they're even more fearsome with mounted cannons or lazer guns on their back. You just don't mess with that. As we march forward in time, changes to the scaly creatures are easily noticable. In 30 years we went from the cute little Bubble Bobble characters to the most insane, blazing neon monsters with rocket launchers. And this is an awesome thing! In Quest for Tires we have to rescue our girlfriend on a stone unicycle who has been kidnapped by a dinosaur who apparently looks like a really cool guy. Here you'll play as a time traveler, setting out to save the scattered dinosaur eggs from prehistoric creatures of all kinds. Taito's classic and popular arcade game (that was later ported to almost everything) featured Bub and Bob, who can easily be called the cutest dinosaurs in video games. Lizzie, once a young woman, mutats into a godzilla-like dinosaur as one of the playable characters in Midway's 80s arcade game Rampage. 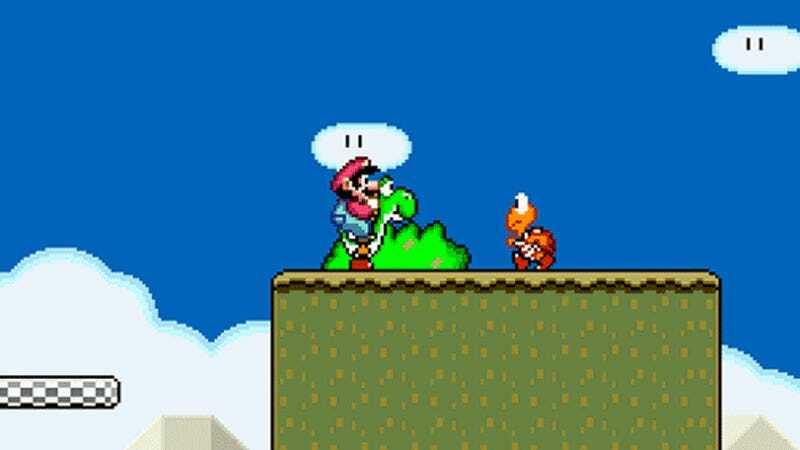 Mario's number one dinosaur buddy Yoshi first appeared in Super Mario World as a mountable pet. The 1993 movie resurrected the dinosaur craze with the speed of light that resulted in several video games linked to the film. Sega's side scroller was among the better titles. Sega also had a Jurassic Park themed arcade rail shooter that wasn't half bad. We have to navigate through Earth's geological periods in this game, including the Mesozoic Era, in Square's really unique game for the SNES. 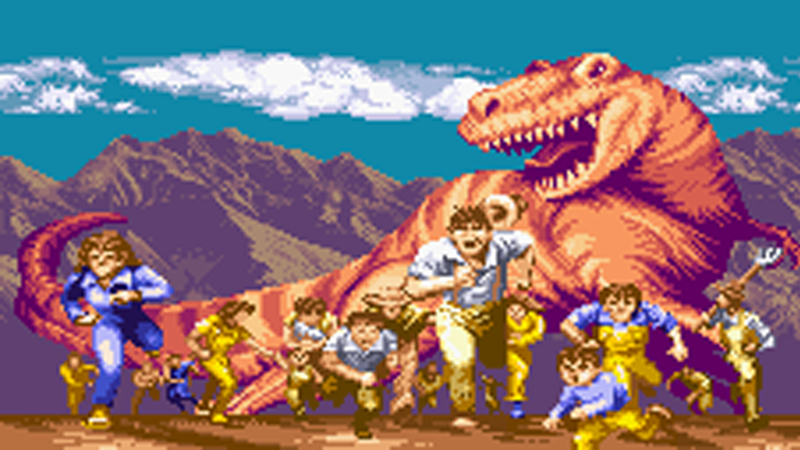 Survivors in a post-apocalyptic Earth have to face dinosaurs in one of the best Capcom side-scroller beat 'em ups based on the comics of the same name. A traditional 2D fighter also set in a post-apocalyptic Earth featuring seven playable dinosaurs (mostly). Acclaim's dino-themed first-person shooter was one of the first games that utilized the capabilities of the very first 3D graphics cards. Resident Evil creator Shinji Mikami's survival horror is set on a remote island where a failed military time travel experiment spawned hundreds of dinosaurs from another era. World War II with a little bit of extra madness. The dinos with cannons mounted on their backs or on their jaws look absolutely insane in 800 North's first-person shooter. Survival with dinos can be hard in a post-apocalyptic Tokyo, even when they are supposed to be at the top of the food chain. Azeroth had dinosaurs before (just think about Un'Goro crater or Epicus Maximus) but the latest content patch took it to another level with the Isle of Giants. Everyone wanted to hunt for giant dinosaurs in the vast jungles of Far Cry 3, and we finally got them in the standalone expansion. Not enough dino craziness? Then you should post the most awesome ones you know from any video game in the comments below!